We just announced that the Kaliki application is now available on the Windows Phone Marketplace, and now it is time for some more Batman exclusiveness on Lumia Windows Phones. Batman Origins, a prequel comic to the soon-to-release The Dark Knight Rises Batman movie, is now available as an application exclusive to all Lumia Windows Phones. 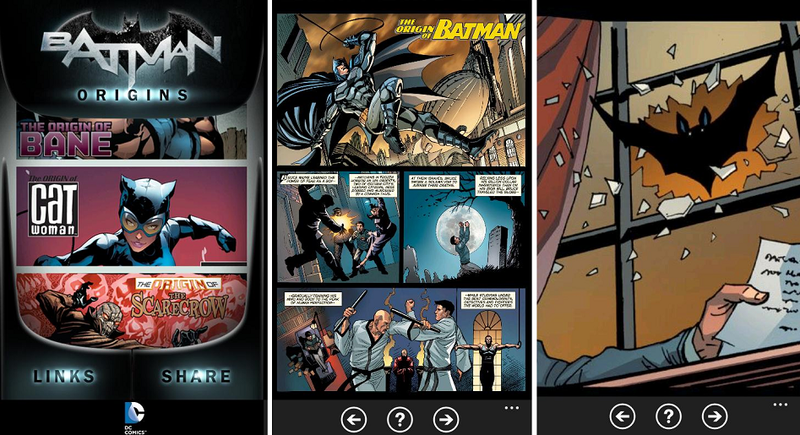 When you open up the Batman Origins application on the Lumia Windows Phone, it pulls you right into the comic story. You can view the comic in the perspective of Batman or Bane, of course tying into the upcoming movie no doubt. Artwork for this prequel comic exclusive to Lumia Windows Phones is provided directly by DC Comics as well. The Batman Origins application also links to what seems to be yet another upcoming Batman application titled “The Dark Knight Rises: Prologue”. Stay tuned to EverythingWM for when that becomes available.